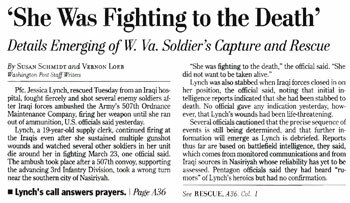 Tomorrow marks the anniversary of the deadly ambush at Nasiriyah in southern Iraq, an engagement so poorly reported by the Washington Post that it catapulted Jessica Lynch to undeserved international fame – and obscured the heroism of an Army sergeant who was captured, then killed. The Post published an electrifying, front-page account of Lynch’s supposed heroics in the battle of March 23, 2003. The report appeared beneath the headline, “‘She was fighting to the death,'” and said Lynch had fought fiercely before being overwhelmed and captured by Iraqi attackers. But the Post hero-warrior tale about Lynch was erroneous. Because of the apparent mistranslation of battlefield radio intercepts, the deeds the Post misattributed to Lynch, then a 19-year-old Army private, most likely were those of a 33-year-old cook-sergeant named Donald Walters. Like Lynch, Walters was assigned to the Army’s 507th Maintenance Company, elements of which came under attack at Nasiriyah in March 2003, during the first days of the Iraq War. Walters (right), a veteran of the Gulf War in 1991, either was left behind or stayed behind as his fellow soldiers tried to escape. Perhaps the most detailed account of the ambush at Nasiriyah appears in Richard Lowry’s masterful work, Marines in the Garden of Eden. Walters is believed to have fired 201 M-16 rounds at his attackers. He was captured and executed by Iraqi irregulars. His killers, so far as is known, have never been caught. “The probable sources of confusion were Iraqi radio communications that the U.S. forces intercepted. These communications reportedly included references to a blond American soldier’s fierce resistance in the fighting at Nasiriyah. And drawing on information sources it has never revealed, the Post published its erroneous account of Lynch’s derring-do. I further note in Getting It Wrong that a brigade commander named Colonel Heidi Brown offered the explanation about the mistranslation, in an interview broadcast in 2004 on National Public Radio’s All Things Considered program. The Post article about Lynch’s supposed heroism, which appeared April 3, 2003, set off an avalanche of similar news coverage in news outlets across the United States and around the world. It was an irresistible, cinematic tale — a waiflike teenager pouring lead into attacking Iraqis, much like a female Rambo. The Post never fully explained how it got the story so badly wrong, and offered but scant interest in the real hero at Nasiriyah. A database search of Post articles published since April 2003 revealed just three stories in which Walters’ name was mentioned. None of those articles discussed in any detail his bravery at Nasiriyah. The Army eventually acknowledged that Walters’ conduct “likely prevented his unit from suffering additional casualties and loss of life” and posthumously awarded him the Silver Star — the military’s third-highest decoration for valor.